DN Food & Off Licence01493 444334work Shop - ConvenienceDN Food & Off Licence in Gorleston-on-Sea near Great Yarmouth is a convenience store selling all your daily essentials and useful items. DN Food & Off Licence in Gorleston-on-Sea near Great Yarmouth is a convenience store selling all your daily essentials and useful items. From Great Yarmouth follow signs for Gorleston-on-Sea. 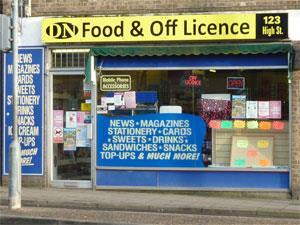 DN Food & Off Licence is located towards the end of the main High Street, just prior to the traffic lights/crossroads.